This review is for the fried fish sandwich. Fantastic. Fresh fish filet fried when I ordered it, hot and crispy. 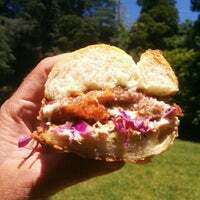 On an acme roll with slaw. Tartar sauce in the side is outstanding. The fries were limp, so request them extra fried if you don’t like limp fries. I keep coming back here to find something that will blow me away but… I just haven’t yet, and I’m afraid that I never will. I don’t wanna say never, but I just haven’t been too impressed with what I’ve had. As far as their fresh seafood goes, they honestly can’t be touched. 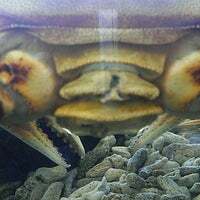 Live lobster and live crab crawling around in the tank. I mean… it can’t get any fresher than that! 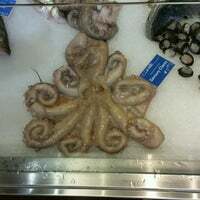 They have all kinds of fresh seafood for sale. Now, I can’t say that the price is the greatest… because it ain’t. 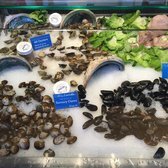 This is Rockridge… and that is FRESH seafood. And, you’re gonna pay for it… you’re gonna pay A LOT for it. But, the quality is what warrants the price here. They even sell fresh made sushi from Uzen Restaurant down the street (I know the chef personally, and that sushi is good!). 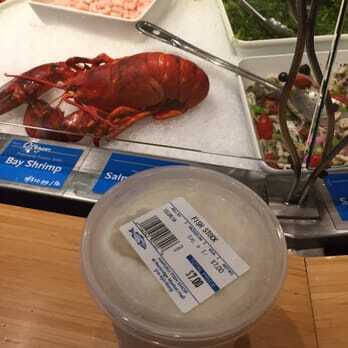 The fresh seafood isn’t really what I have a problem with per say. It’s their hot foods that I just can’t seem to fall in love with. It’s so convenient for lunch, but their soups and their fish and chips are seriously lacking in flavor. The presentation is wonderful, but it needs more seasoning. 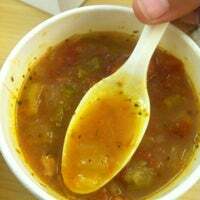 They have a daily soup menu that they serve from 12-6 everyday, and they’ll even let you sample a little bit of the soup to see if you like it. They also serve fish and chips and fish sandwiches as well. Their fried fish is fried perfectly! Seriously, it could be perfect… COULD be perfect if they just seasoned it more. It’s just so damn bland and it makes me sad because it looks so good. Their garlic fries aren’t half bad. But, for a place that prides themselves on fresh seafood, I was expecting them to use “fresh” garlic on those fries. Wasn’t really a fan of the garlic powder but hey… to each their own I guess. They still tasted okay. The soups are hit or miss. Sometimes they’re flavorful, and sometimes they’re not. Unfortunately, it’s not always so easy to figure it out with a piping hot sample either. More often than not, their soups have been “just okay”. Maybe I just haven’t found the “one” yet, but I think I’ve tried enough times to come to the conclusion that it just ranks average. This is the fish stall inside Market Hall. We came here earlier today looking for mussels. Slightly pricey at $7.99/lb, but they looked pretty fresh. We got a little over 1.5lb, and made sure to keep them on ice, in the fridge, bag open so they could breathe. When we sorted through before cooking, there were 3 dead mussels that had large cracks and didn’t close their shell (tossed these), and another 3 with cracks/chips that seemed alive, so we cooked them. They were mostly debearded (which is great! ), so I’m surprised the staff didn’t catch the ones with really obvious cracks. 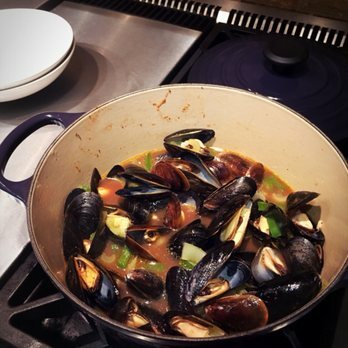 We steamed the mussels in a Bloody Mary sauce–delicious. The mussels were tender and tasted light and fresh. Paired with an Acme baguette also from Market Hall. Would definitely get more fish from Hapuku. The surrounding stalls are also pretty fab: Marin Sun Farms, and Paul Marcus Wines. Everyone who has ever visited Rockridge has possibly seen Market hall and probably strolled through it. 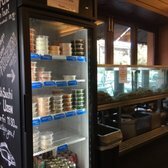 I discovered a gem hidden behind market hall after their wine and cheese area which is their fish shop. We got the fried fish with garlic fries and oh my god they were good !! The fish was soft and white and the batter was delicious and light and so flavourful. It did not feel like a heavy fried dish at all. The fries were home style and very tasty too. Note : The portions are big so of you are not too hungry two people can share a fish n chips. Also ask for more tartar sauce because it’s so good !! 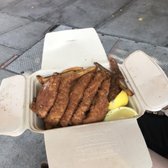 Although I am not the biggest fan of fish and chips, I decided to check out Hapuku Fish Shop and see if their version of the meal was worth a visit. 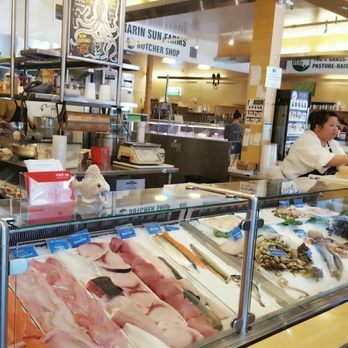 It’s located in Market Hall near the meat section, and they do offer fish for purchase if you are looking for a fish monger. The ordering process was quite smooth, and despite visiting on the weekend while the market was bustling, there was not much of a line. 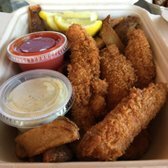 I thought it was great that they prepared the fish fresh to order, and I was excited to try the garlic fries (I’m a sucker for garlic). While I liked that the fish was seasoned, I thought the batter was not crispy enough. The fish ended up having a somewhat mushy texture, which is not what I expect with your typical fish and chips. They offered a mountain of fries; seriously, it was probably the biggest serving of fries that I had seen in a long time. However, the garlic flavoring was pretty bland; I gather that they just used garlic powder, and some fresh, chopped garlic could have really boosted the taste. I would consider going back to try it again (especially since the service was great), but my first experience was a medium disappointment. 4.5 stars! I am only writing this for the fish and chips! The fish is super fresh, and it literally falls apart when you try and eat it with a fork! 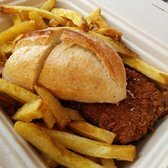 Super crispy and delicious- a hidden gem one must try before leaving Berkeley! The first time I came, I tried the curry fries which were delicious as well. Friendly staff; no complaints here. Tables outside where you can stand and eat. I wish they have water/water cups because I get thirsty eating those fish and chips. Normally we go to Tokyo Fish market but they are not open on Sunday. 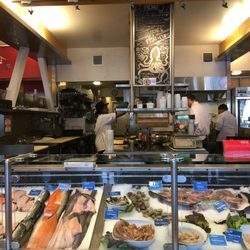 So a quick search on Yelp brought up this cute little fish shop close to the farmers market we go to on Sunday. 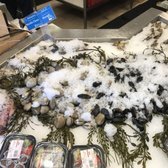 We got Scollops, shrimp, sole, salmon and some fish stock. Everything was fresh and beautiful. The fish stock is excellent. I love that the fish and meat market are together with a small grocery store just a few steps always. 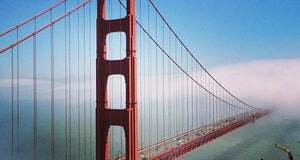 Located in a very cute area right close to BART. There is street parking but is is crowed and the parking is a bit limited. We got there right before it opened, at 10:00, and had to park around the block. Can’t imagine what the parking is like later in the day. I would recommend coming early to beat the rush. Service and quality–great reasons to come here! Whenever my husband and I shop at Market Hall, we almost always stop here to get a piece of wild salmon steak, a pound of shrimp cocktail or a filet of two of halibut. I have also purchased a live Dungeness crab here and had them steam it for me during California crab season. 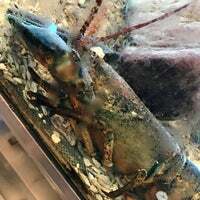 Want lobster? 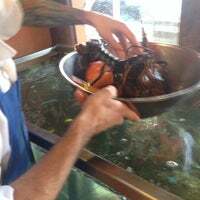 You can also have them steam a live lobster. 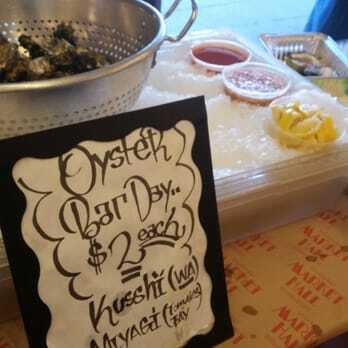 On Saturdays, they have an oyster stand where you can get oysters for $2 each. If you’re too lazy to cook fish, you can also buy fish and chips here. We’ve only done that once, but it was good and inexpensive. You can eat on the benches just outside of Market Hall. Best to eat it as soon as it comes out of the fryer. 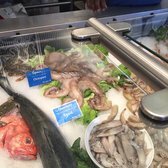 If you’re looking for fish stock for bouillabaisse or cioppino, they sell stock here. So much easier to buy than to make! After searching for fish heads and bones and going through all the steps in making fish stock, I’ve learned how time consuming it is. However, since good fish stock is critical in making a great bouillabaisse, you really have to have it one way or the other! Buy it here! Yes, they’re pricey, but good wild fish and shellfish are worth it. 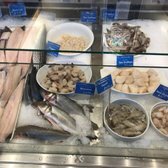 We avoid eating farmed and unsustainably caught fish, and since we only eat fish/shellfish twice a week, the prices are not an issue for us. 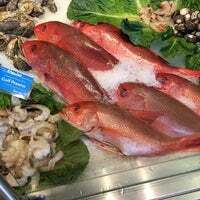 It’s still cheaper to eat good fish or shellfish at home compared to eating them in a restaurant! I tried Hapuku based on the positive yelp reviews. I ordered the fish and chips and the crab and scallops soup. The fish was thickly coated and although crisp, which ai liked, it was totally tasteless. The texture of the cod was soft, almost mushy. The much-heralded garlic fries were greasy and soft. The fish soup, my last hope to salvage this food experience – nope, completely devoid of flavor. It’s as though the food is prepared for people with multiple dietary restrictions like low/no salt, no pepper, no herbs, no spices or anything else that makes food taste good. I do not recommend. 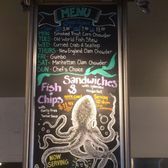 Located inside Market Hall, this fish shop has some daily specials, but I came here to try their fish sandwich and fish and chips. We tried both, one with fries and one with curry fries. It was sooo good! The fish was huge (3 large pieces), the breading was unlike most other fried fish…seemed to be more like panko rather than batter. The fish was crisp, and came piping hot! The fish in the sandwich was too big for the bread. It was a bit messier to eat, but still very tasty. The curry fries were phenomenal (I liked them better than the garlic ones). The portions were so large that I couldn’t even finish my order, but I’d come back for more! No seating, just a tall table to eat at or else you can walk to the cafe area and use any of the tables there. Outstandingly soups, a different one every day. Always amazing, and I’ve eaten many of them! I buy prawns her often- always fresh and delicious! Great store. I came here for lunch after seeing the reviews of their specials. I ordered the fish sandwich and fish and chips platter. The quality of the fish was excellent however everything was under seasoned. The portions were very hearty though. Not sure if I would come back for take out. Delicious, super-fresh fish sandwich and soup. (Reasonably priced, too, by local standards. The sandwich is pretty big.) Soup flavor changes every day. Staff is wonderful! A hidden lunchtime gem. Always see smiling faces and great service. And did I mention the freshest seafood in the area. The breading on their fish is more along the lines of panko, rather than a batter, which makes it way less greasy. The fish tasted fresh and both dishes came with nice big fillets. The fries are thin rather than those thick wedges that usually accompany fish n chips (I prefer thin fries), and were really delicious, but a bit salty. 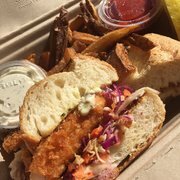 The fish sandwich comes with a yummy, tangy coleslaw which compliments the fish nicely, and both dishes were served with a side of really good tartar sauce and ketchup. We ordered our food to-go, and where it would of course be better if eaten at the location (there is a counter you can stand at, or some random spots outside, but no real formal seating), the to-go boxes are wax lined instead of being absorbent paper, which makes the food a little soggy by the time you get home. 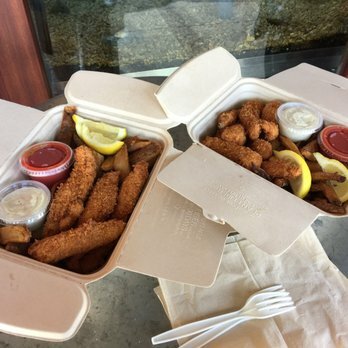 We understand that this is going to happen when ordering “to-go,” however, lining the containers with paper, or wrapping the food in paper, would go a long way in ensuring a crispier product for the travel home. Overall, as fish n chips go, they were the best i’ve ever had! 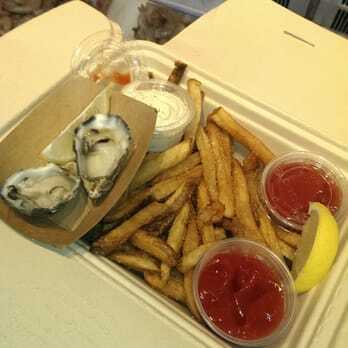 The two best things about this fish market: The fries, omg you don’t usually see fries done right and I am not a fry person (I advocate for those fries). Not the biggest steal. I love my $1 oysters and these are $2, but that’s not bad. The oysters are yummy: Kusshis and Miyagis. Fresh, the guys are friendly and it’s just really fun. They also have yummy seafood soups bisques and chowders, sandwhiches and fish an chips. So yup, it’s cool. The Hapuku Fish Shop had a food booth at the Rockridge Out & About event. When I saw ceviche on the menu, I was interested. 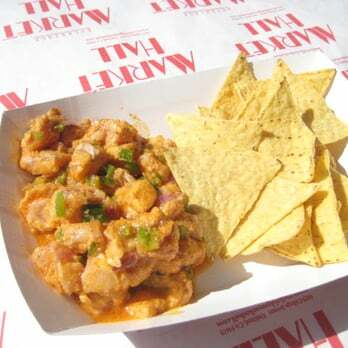 When I saw someone walk away from the booth with ceviche in hand, I was sold. The ceviche definitely tasted fresh. It could have used a little more salt, though the chips helped a little. I also would have liked some hot sauce. I definitely got my money’s worth– $6 for a hearty portion of ceviche! Good food but not very helpful staff. We showed up at 5:02 and were told they don’t make fish sandwiches after 5pm. The women had a spray bottle if cleaner in her hand and the counters were soapy even though the store was open for another hour. I’ve worked food service and I understand that it’s nice to get home, but I think these employees were doing a disservice to the owner and reputation if the business by making the business look like it was closed (they obviously had started cleaning before 5pm), when they had another hour to sell food. So yeah, very low rating. This is the second time I’ve been here and the fish sandwiches are amazing. Disappointed with the amount of french fries they gave us the second time but overall you will always get fresh fish here. 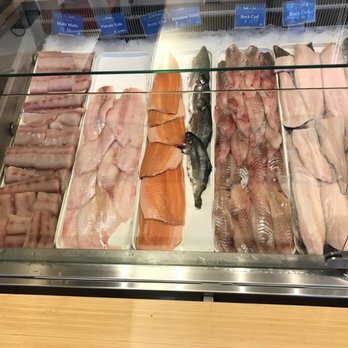 Nice cuts of fresh fish! 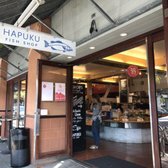 Yelp users haven’t asked any questions yet about Hapuku Fish Shop. Start your review of Hapuku Fish Shop. Look at all of that fish! A quart of fish stock for the Bouillabaisse I made! 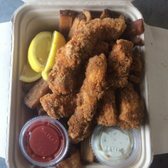 Follow Ready To Be S.
Stop following Ready To Be S.
The fish & chips are amazing actually, not the traditional battered-fried fish, and the fries are like these awesome cajun-style fries, but you can pick what type of fish, I got the petrale sole. 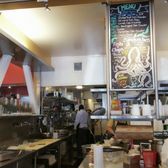 In Rockridge’s Market Hall, come here for the freshest catch of the day, fried up in a sandwich or with fish and chips, ceviche, and oysters on the half shell on Sundays. 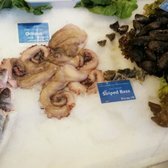 Nice boutique fish market. 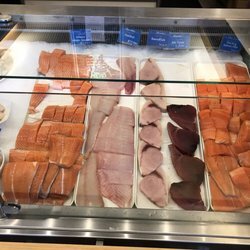 Helpful staff and a section that goes way beyond salmon and tuna. Oysters are $1.50. Add an extra $.50 if you want them shucked. Yum yum. Try the Fish & Chips with Basa. Cheap bit delicious. 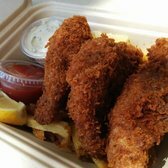 Fish and chips Thursday – Saturday.